The International Baseball Federation (IBAF) is announcing the schedule for first round of the upcoming XXV 18U Baseball World Championship in Seoul, Korea. The tournament will be played from Thursday, August 30 to Saturday, September 8. 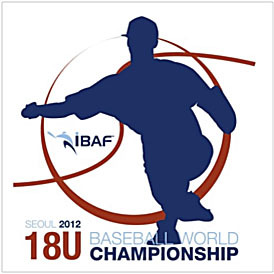 12 Teams will participate in the XXV 18U Baseball World Championship, which will be transformed into the 18U World Baseball Classic in 2013. 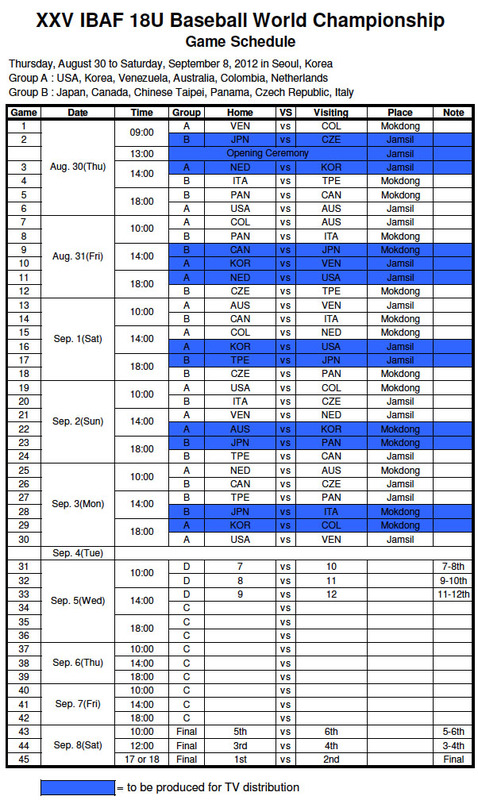 USA, Korea, Venezuela, Australia, Colombia and the Netherlands will be slotted into Group A. Group B consists of Japan, Canada, Chinese Taipei, Panama, Czech Republic and Italy. The Mokdong and Jamsil Baseball Stadiums in Seoul will serve as venues. 11 games from the first round will be televised. In 2010 Thunder Bay, Canada hosted the XXIV 18U Baseball World Championship. Chinese Taipei went all the way and won the gold medal thanks to an 8-4 victory over Australia in the championship game. Cuba finished in third place ahead of Canada. The USA and the Netherlands finished in fifth and sixth place.